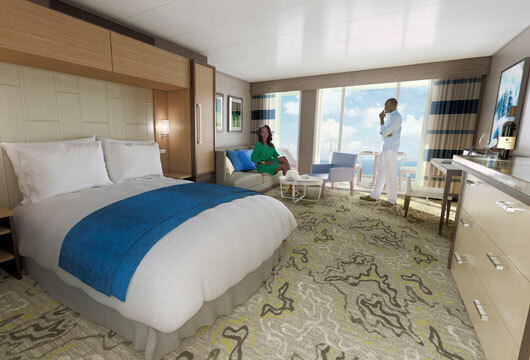 It all feels a lot closer when a new cruise ships’ opening routes and itineraries are announced. Like when the Christmas decorations first get put up, the anticipation grows to almost tangible levels. The Anthem of the Seas is now hotly anticipated with a number of exciting routes planned. Here are the five fantastic cruises that the new liner has planned. A relaxed cruise around France and Spain with three full days spent at sea gives passengers the opportunity to be amongst the first to enjoy all of the activities on board the Anthem of the Seas. Whether they want to enjoy the incredible views afforded by the North Star Observation Pod which lifts passengers 300ft in the air or dine at one of the eleven complimentary eateries, this cruise is sure to entice holidaymakers of all ages. A cultural trip for lovers of city breaks, the tour of cities of distinction gives passengers the opportunity to experience the delights of Barcelona, Rome, Nice, Florence, Seville and Lisbon amongst others. With nine city excursions included in the action-packed itinerary, passengers will be able to enjoy the best that the continent has to offer in just over a fortnight. For those not planning on taking all of the excursions, the Quantum class ship has almost unparalleled relaxation options on board. This is the ideal spring trip for sun worshippers. The temperatures in the Canary Islands begin to really grow throughout May, meaning that the Anthem of the Seas’ four beautiful swimming pools and ten Jacuzzis will be popular. The cruise takes in excursions to three of the Canary Islands as well as the beautiful, volcanic island of Madeira. A short trip with just enough time to experience and enjoy all of the splendour aboard the Anthem of the Seas; the Royal Experience cruise is an ideal romantic excursion. Stopping in the beautiful cities of Bruges and Paris; the Royal Experience is perfect for couples looking for a long, relaxed weekend away from the kids and the stresses of life. Compare the culinary wares of authentic Italy with the beautiful dishes provided by the on-board restaurant by Jamie Oliver. The Jamie’s Italian franchise is coming to the seas for the first time after building up a reputation of producing fine dishes and stocking a comprehensive list of wines. The cruise takes in some of Italy’s most stunningly beautiful and culturally significant cities such as Rome and Florence, before taking in Spain and Portugal. For more information and booking a cruise aboard the Anthem of the Seas, call 0808 274 6777.